Ukraine’s snap parliamentary elections have once again proved that the mainstream of society rejects the far right – not that the Russian government or media will care. Since the very beginning of the Euromaidan protest movement – which would go on to drive President Viktor Yanukovych from power – the Russian state line on Ukraine has been all but unwavering: the country is routinely depicted as overrun by terrifying Nazis, hell-bent on destroying Russian speakers within Ukraine, and then Russians; and then, perhaps, the world (but definitely Russian speakers first). Prominent Russian opposition leaders, including Aleksei Navalny, have argued that the idea of popular protests driving out a corrupt regime next door was so unsettling for the Kremlin that Ukrainians had to be re-cast as hardliners overnight. But the Russian opposition has little credibility in Russia, a country where the overwhelming majority gets their news from state television; and that, combined with patriotic fervour over the annexation of Crimea, coupled with vocal Russian support for the rebels in Ukraine’s Donbas region, has made the notion that ‘Ukraine is now a Nazi country,’ an easy sell. 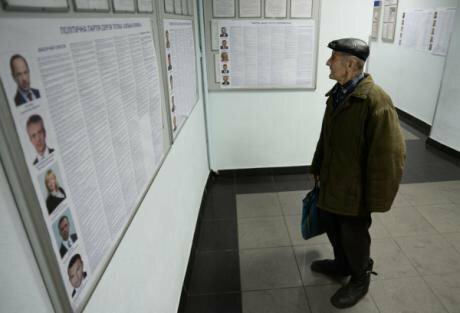 With over 93% of the vote counted on Tuesday evening [28 October], over 24 hours after the polls closed, President Petro Poroshenko’s party Poroshenko Bloc was at 21.79%, slightly behind Arseny Yatsenyuk’s People’s Front, which had 22.21%. There was also a surprisingly strong showing of nearly 11% for the newcomer Christian democrat party, Samopomich (literally, the Self Help party), started by Andrii Sadovy, mayor of the city of Lviv in western Ukraine. Sadovy came to national prominence earlier this year for supporting the Euromaidan movement, while working to dispel the notion that western Ukraine is solely populated by dangerous radicals. By contrast, the far-right Svoboda party, headed by Oleh Tyahnibok, received less than 5% of the vote and appeared unable to cross the 5% threshold needed to gain seats in parliament. The Radical party, headed by populist Oleh Lyashko, whose firebrand political style has been compared to Russia’s nationalist Vladimir Zhirinovsky, and who was accused by rights groups of exacting vigilante justice by torturing alleged separatist leaders, received just 7.5% – even though ahead of the election there was widespread fear among moderates that Lyashko might poll in the double digits, and even be a contender for the post of prime minister. The Ukrainian far right has continued to fail in its attempts to appeal to the mainstream public. Based on the data, it would seem safe to conclude that the Ukrainian far right – although certainly growing more prominent during months of turmoil and armed conflict – has continued to fail in its attempts to appeal to the mainstream public. But while the Russian establishment has been striving to paint mainstream Ukraine as having an ethnic-based hatred of the Russians – former Russian spy chief Nikolai Patrushev famously told Rossiiskaya Gazeta last week that ‘a whole generation of Ukrainians [have been] brought up to hate Russia’ – the reality on the ground is much more complicated than that. For while anti-Russian feelings in Ukraine have been on the rise, they have taken on a political, rather than ethnic-based dimension – not a surprising development, considering that Ukraine has been losing lands to Russia. In 2014, for the first time ever, a majority of Ukrainians – 52% that is – reported that they wanted to join NATO, a development that can, no doubt, be put down to Russia’s newfound habit of ignoring the concept of Ukraine’s territorial integrity. When talking to ordinary people on election day, meanwhile, I made a point of speaking Russian. In bilingual Kyiv, it is common for Russian and Ukrainian speakers to address each other in their native languages – though while being interviewed, plenty of Ukrainian speakers switched to Russian out of politeness. Even the fighters of the notoriously right-wing Azov battalion have no problems speaking Russian – whether to journalists or among each other. Even the the notoriously right-wing Azov battalion has no problem speaking Russian – whether to journalists or among themselves. If anything, the greatest concern now is that Ukraine, while thankfully not turning to mass extremism, is nevertheless returning to business as usual. An oligarch – Poroshenko has a confectionery empire – is in charge of the country, and aside from the Communists, which were hounded out of the public sphere following the toppling of Yanukovych, and did not receive enough votes to even enter parliament, the political establishment includes any number of familiar, if somewhat rebranded, faces. Meanwhile, the economy is tanking; and voters in Kyiv say that in spite of a revolution that occurred under the banner of European integration, officials are in no hurry to adopt European values. Voters complained of corruption everywhere – from the judiciary to education. 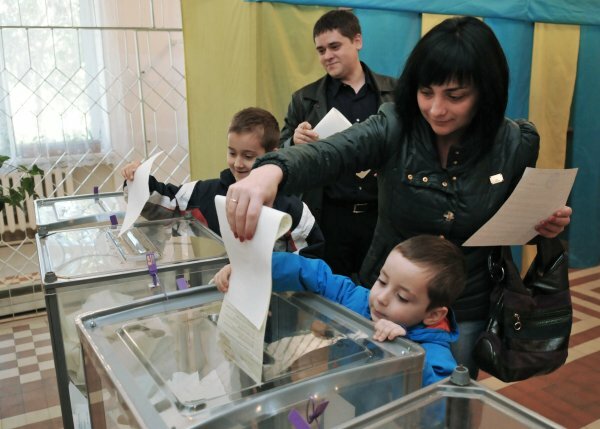 Voters complained of corruption everywhere – from the judiciary to education; they pointed out that state hospitals remain as underfunded as ever; spoke bitterly about the state of the roads and other public infrastructure; pointed out that, in general, Ukraine’s oligarch class was living as well as ever while the rest of the country suffered; and said they had little to be excited about. With winter looming and temperatures regularly plummeting below zero, many were also concerned about the possible fallout of the latest gas dispute between Ukraine and Russia – with some fully expecting Russia to ‘pull the plug’ at the worst possible moment. The conflict with Russia, frequently referred to as an undeclared war these days, was usually referred to with a mixture of disappointment and resolve. Solovyov’s point of view offers a simple, catch-all explanation for both Ukraine’s domestic problems and the deterioration of its relationship with Russia. By adopting the view that ‘they’re all just Nazis,’ Russia can be absolved of any wrongdoing with regard to either Crimea or the Donbas. It is a view that is bound to continue to dominate the Russian state media, if only because the Russian economy is similarly headed into troubled waters. With the oil price going down, sanctions biting, inflation rising, and the rouble plummeting, Russia faces both budget cuts and a decreased buying power for ordinary citizens – and this is just the beginning. The oil-dependent Russian economy was fragile before the Ukraine crisis resulted in a de facto stand-off with the West – now its outlook is even less positive than before. For the Kremlin, it is therefore strategically important that the image of an unequivocally ‘Nazi’ Ukraine continue to endure. Otherwise, Ukraine is instead a country that successfully managed to throw off a corrupt government. For the Kremlin, it is therefore strategically important that the image of an unequivocally ‘Nazi’ Ukraine continue to endure. Crucially, while Ukraine has experienced no magical overnight transformation, regime change itself is a key issue for the Kremlin. Russia sharply criticised the U.S. backing of Euromaidan. not just because the Kremlin saw America as an intruder into its traditional sphere of influence – but also because the Kremlin was increasingly worried about similar U.S. support for regime change in Russia itself. There is a bitter irony to the Kremlin’s actions in this regard. While the U.S. has been keen to openly intervene everywhere from Iraq to Libya, the reset policy with Moscow had in recent years been focused on treating Russian president Vladimir Putin as a partner, individual foreign policy hawks notwithstanding. While continued NATO expansion was a thorn in Russia’s side, it still wasn’t enough to trigger a significant confrontation. But by making Ukraine a point of contention, and, specifically, supporting rebels in the Ukrainian east, Russia may have made itself a target for regime change after all. The annexation of Crimea enraged the West, but it was also a ‘clean’ affair, at least in the beginning (reports of disappearances of ethnic Tatars on the peninsula show that troubles in Crimea are far from over). By contrast, the rebel uprising in Ukraine’s Donbas region has sown bloody chaos. The downing of Malaysia Airlines Flight MH17 over that territory in the summer demonstrated to Western leaders that even their own citizens could easily be sacrificed in this conflict. Therefore, as prominent Russian analyst Fyodor Lukyanov pointed out over what turned out to be one crazy summer, the West’s long game is now most likely geared toward regime change in Russia, with sanctions as the most obvious tool. The West’s long game is now most likely geared toward regime change in Russia, with sanctions as the most obvious tool. Other tools at the West’s disposal are the aforementioned oil price. If Ronald Reagan did indeed get the Saudis to drive down the oil price in the 1980s in order to financially cripple the Soviet Union, there is the possibility that Saudi Arabia, a U.S. ally, may have been persuaded to help lower prices (though other incentives obviously existed as well). Either way, while the scenario of Russian regime change has any number of potentially disturbing, destabilizing outcomes, all evidence points to the fact that Putin is simply no longer trusted by Western leaders – and Putin himself vigorously returns the favour. Not even the threat posed to both Russia and the West by ISIS, has been enough for either Russia or the West to consider repairing impossibly strained relations. Back in Ukraine, everyday concerns continue to trump geopolitics. The majority, regardless of allegiance to a particular political party, is focused on survival – on digging in, come hell or high water. Everywhere, from shabby state hospitals to basement bars downtown, from little golden-topped churches to garish shopping malls on the outskirts of town, Kievans are focused on the idea that they must keep going. Ukrainian flags that decorate many balconies and vehicles in the capital have faded in the sunlight over the summer, and now look like a testament to grim determination – things may not be pretty at the moment, these flags say, but we will be hanging on either way.